In the past few weeks there have been three tournaments, all with first time winners. 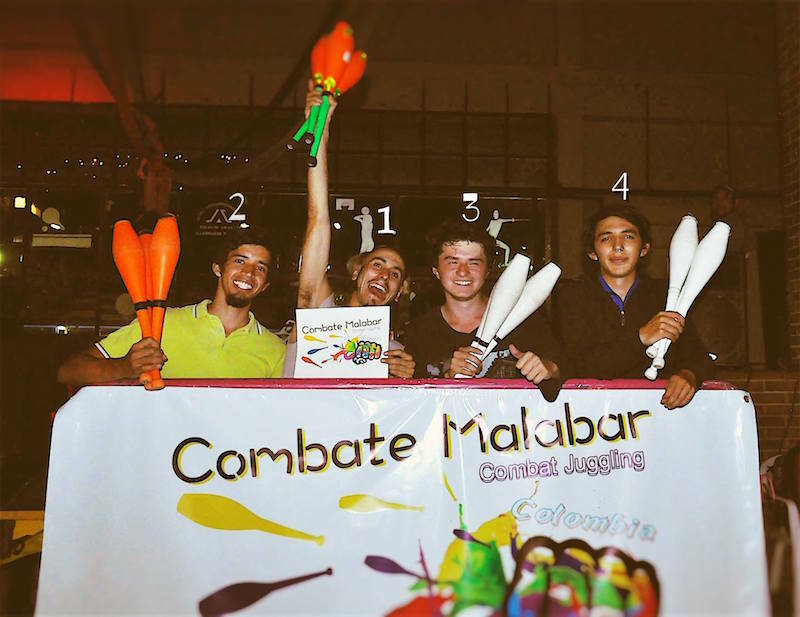 First up, the latest tournament in Bogota, Columbia, at their World Juggling Day celebrations: Bogota Dia Mundial del Malabarista 2016. The qualification was by group melee combat, with every juggler playing against every other, all at the same time, 8 times in a row, to pick out the jugglers who would play in the knockout rounds. The final winner of the tournament (250 ranking points) was Oscar Martinez, who beat Luis Angel Bravo in the final. Over in Poland, the Ostroda Fire Festival hosted its second Fight Night. 16 players took part in the qualifications, and eight made it through to the knockout. Michał Kozak, whose previous best result was the round of 8 at in Lublin earlier this year, ended up on top in a 5-2 final match against Rafał Polakowski. Michał also wins 250 ranking points, bumping him up to 15th in the 2016 Race Rankings. Finally the French national juggling festival, Convention Francaise 2016 Vanosc, hosted its first tournament. This was a 500 point event, with 21 competitors trying to qualify. While three French jugglers made the knockout (Michael Masson, Florent Gaillardo, and Aachen 2016 winner Leo Platz), all were knocked out in the round of 8. So the final four players at the first French Convention Fight Night were three jugglers from Chile and one from Australia. Byron Hutton, winner of the Melbourne 2014 tournament, came in third, beating Bastien Von Martins from Chile. Cristobal Bascur and Andres Schlein, also both from Chile, battled it out in the final, with Andres winning 7-5. All tournaments award points to everyone who takes part, and every players' points are used to seed qualification groups at big tournaments... like the EJC Fight Night, which will be taking place next week!